A Moorish dish with the combined flavors of Spain and Portugal with subtle hints of North Africa. 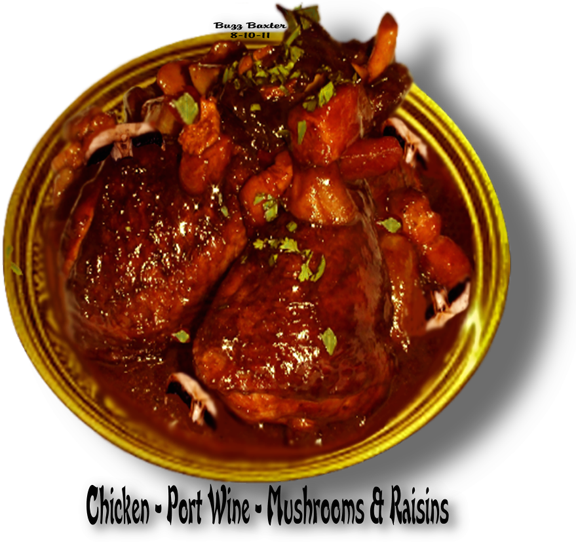 Chicken enhanced with an irresistable sweet and sour sauce! •   Fresh herbs -  flat leaf parsley,  green onion tops or fresh mint for garnish. 1. Soak the raisins in the port wine at least 1 hour or, preferably, overnight. 2. Preheat oven to 375º degrees. until golden brown. Turn the chicken over and brown the other side. Transfer to an ovenproof dish. garlic and carrots and sweat them for 2 minutes. in the raisins and their soaking liquid. Cook until the liquid is reduced by half. minutes, but do not bring to a boil. 7. Adjust the seasoning with salt and pepper. top and garnish with the carrots,  and fresh herbs. COOKS NOTE:  Couscous or rice pilaf would make a perfect side dish.